1. Season the chicken all over with 1/4 teaspoon each of the salt and pepper. 2. Heat 2 tablespoons of the oil in a large, wide-bottomed pot over medium-high heat. Once the oil shimmers, add the chicken and cook for about 4 minutes total, stirring once or twice until it has browned, then transfer it to a plate. 3. Add the remaining tablespoon of oil to the pot and reduce the heat to medium. Add the onion and cook for 5 minutes, stirring, until it has softened. Add the garlic and cook for 30 seconds, then stir in the cumin, coriander, cinnamon, crushed red pepper flakes and the remaining 1/2 teaspoon of salt and 1/4 teaspoon of pepper. 4. 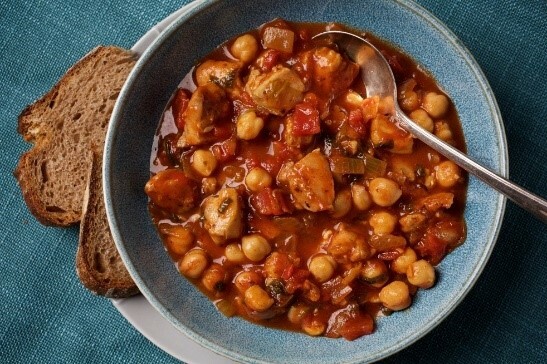 Add the diced tomatoes with their juices, the tomato sauce, chickpeas and water. Bring to a boil, then reduce the heat to medium-low, cover and cook for 10 minutes. 5. Return the chicken with any accumulated juices to the pot; cover and cook for 8 to 10 minutes, until the chicken is tender and cooked through. Stir in the spinach and cook until it is wilted, 1 minute more. Taste, and add more crushed red pepper flakes, as needed.